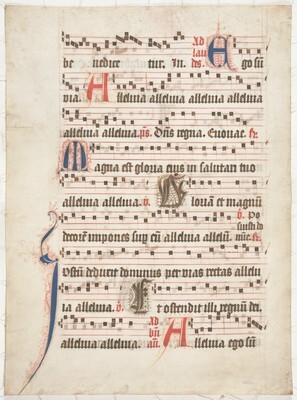 Leaf from an antiphonary gifted to the Australian National University Library in 1984 by two sisters - June Carnahan and Dawn Power (née Meyrick). It is named the 'Meyrick Page' in honour of the donors. The stamp of an earlier owner, Ernst von Feder (1824-1904) of Karlsruhe, is imprinted on the leaf. The originating antiphonary was probably produced in Germany in the sixteenth century. Contents: Antiphons and responsorial chants for the Feast Common of one Martyr. Page 84. Decoration: Ten large cadel flourished initials in red, blue and brown, with extended pen trailing to the capital of the response incipit Iustum deduxit dominus per uias rectas and anthropomorphic detail to the capital of the verse incipit Letamini in domino et exulte iusti et gloriamini. Psalm incipt and euouae have small black capital with red highlight. Square musical notation on a 4-line stave.